Summer has arrived, and temperatures are skyrocketing. 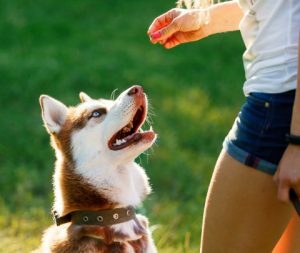 While summer can be a great season to spend time outdoors with your dog, it also poses a unique set of risks that you don’t have to worry about the rest of the year. The biggest summertime risk for your canine companion is heat exhaustion. Here, we will look at a few of the warning signs for heat exhaustion, dogs who are at a higher risk, and what you can do if your dog succumbs to the heat. Dogs suffering from heat exhaustion will display a variety of symptoms, including excessive panting, lethargy, difficulty breathing, excessive drooling, increased heart rate, and collapsing. If you notice any of these warning signs, you must act quickly. All dogs can suffer from heat exhaustion, but certain breeds are far more prone. Dogs with short snouts, like bulldogs, pugs, boston terriers, and boxers have trouble panting quickly enough to cool themselves down in extreme heat. Dogs with really thick coats, such as malamutes, american eskimos, and huskies are also at increased risk. Any dog left in a hot environment, such as a car, is at high risk. You should never leave your dog in the car when it is hot outside. Not only is it extremely dangerous for your dog, it is also illegal in California. You risk fines and possible jail time, not to mention the health of your dog. If your dog is exhibiting any of the symptoms above, it is extremely important to cool them down safely. Cooling them down too quickly can actually be extremely dangerous. Begin by moving them out of direct sunlight. If you can bring them indoors that is best. Cooling them down with a cool (not ice cold) shower is a great way to safely lower their body temperature. If you have to stay outdoors for whatever reason, using a hose to begin cooling them down will work too. If you are unsure of how to proceed, call us immediately for assistance. If your dog succumbs to heat exhaustion, they are at risk for heat stroke, which can be deadly. Severe heatstroke occurs when your dog’s body temperature rises above 106 degrees fahrenheit. Heat stroke can send your dog into shock, put them into a coma, or kill them. As you can see, the summer heat can be a major hazard to your dog’s health. After beginning to cool your dog down using the steps above, give us a call. Our mobile vet in Los Angeles can come to you to make sure that your dog is recovering properly, and can check for any complications that may have arisen. Contact us today for all of your veterinary needs.